For students following courses leading to the Principles of Business for CSEC examination. 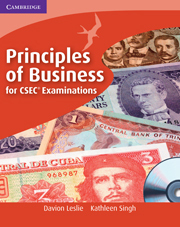 Principles of Business for CSEC® Examinations with CD-ROM offers comprehensive coverage of the Principles of Business for CSEC® syllabus including the School-based Assessment component of the examination. The book guides students through the syllabus content using a wide range of case studies from across the Caribbean. Written in accessible language and presented in full-colour throughout, the book contains a variety of questions and practice materials encouraging students to engage meaningfully with the content.Concepts are presented in an accessible way without losing their core meaning. Each section has its own summary and activities and interspersed throughout the book are numerous opportunities for students to interact with the content in meaningful ways as they reflect on what they read. The accompanying CD-ROM includes a bank of multiple-choice questions with answers provided.For more information and to purchase your Caribbean resources, go to our How to order page.Mac users please note that CD-ROMS don't autostart when used with Macs they will need to be started manually. If you have any queries please visit our customer support page or contact customer services. 11. School-based assessment and optional paper.